The Manaslu Trek (or Manaslu Circuit Trek) 2018 /2019 is a 14-day tea-house trek which circumnavigates the 8th highest peak in the world (8,156 m). The trek has all the elements of other treks in Nepal including both Hindu and Buddhist culture, protected wildlife, rhododendrons and wildflowers, raging rivers, precarious bridges and stunning mountain scenery. The trek is much easier than it used to be with greatly improved trails along the Budhi Gandaki river gorge. In terms of difficulty, it is comparable with the Annapurna Circuit Trek or Everest Base Camp trek. Its highlight is undoubtedly the spectacular unhindered views of Manaslu. Just over 2,000 people complete the trek per year with more than half visiting in October. This is substantially fewer than visiting Annapurna, Everest or Langtang. There are two main reasons for the fewer numbers. The first reason is that the trek used to require camping, as there were too few tea-houses along the trail. In particular there was no lodge below the Larkya La (a pass at 5135 m) requiring an enforced night of camping? This is no longer the case. Since 2010 there is a tea-house below the pass and all the way up from the starting point. A few of the tea-houses are still basic compared to counterparts on the Annapurna Circuit, but most are comfortable. The second reason is that the trek has restricted area status. This means it requires a special permit (see below), that the group have two or more members and that a registered trekking guide accompanies the group. the permit fee was reduced to US$50 per week. These two factors together have made the trek affordable for budget travelers and it is now being referred to as The New Annapurna Circuit. Manaslu region is still under development for tourism business. In the past, visiting the remote parts of Nepal was only possible by camping trekking for adventure holidays. Due to the increasing number of travelers, small lodges in the major places are being developed. So, now you can trek by staying on local lodges (tea houses) without camping in this famous trekking area. Manaslu trekking can be done either way – staying at lodges (tea-houses) or camping. You have to arrange this trek through a registered trekking agency, nepal planet treks.com) even though you may just be two people with a single guide. The agency is necessary for arranging the permit, as individual tourists are not permitted to do that. Prepare as you would for any other trek equipment-wise. Water purification such as chlorine (drops or tablets), iodine or a portable filter will be needed. Get fit. In addition to the restricted area permits are permits for two national parks and a general trekking permit. September to November per week per person US $ 70 and after Per Person 10 US $ each extra day. December to August per week per person US $ 50 and after Per Person 7 US $ each extra day. which must be bought through a registered trekking agent Normally only one week is needed from Jagat to Dharapani if not visiting Tsum Valley. • TIMS card : US$10 (No necessary TIMS around Manaslu Conservation Area when you have a restricted area permit!) But must require if you change your mind to go Annapurna Circuit. 10: Samdo – excursion up to Tibetan border recommended. 11: Samdo to Larkya Phedi, 4h [4460m good lodge (64 pax)] Note that this lodge may close during November, as occurred in 2013. If accommodation is not available at the lodge then an early start from Samdo, e.g. 2am, and long day will be needed to reach Bimtang. 15: Besisahar [800m good lodges] – Public transport departs from here. It is also possible to start from Gorkha Bazaar which is quicker to reach from Kathmandu on a smoother road. You can find onward transport to Barpak, where there is accommodation, and continue via Larpak to join the main trek. A side trip to Tsum Valley is also possible. This used to require camping or pre-arranged homestays, but can now be done as a teahouse trek, staying at lodges (though facilities are more basic than on the main trekking route). Itineraries can be as short as 10 days, excluding rest days, or as much as 21 days, taken at a relaxing pace with plenty of exploring. It is also entirely possible to combine with the Annapurna Circuit: from Dharapani, continue to Manang and over the Thorung La at speed having already acclimatized. Then fly or bus out from Jomsom to Pokhara. Others options include the trek to Nar and Phu, taking advantage of trek-earned acclimatisation and fitness. 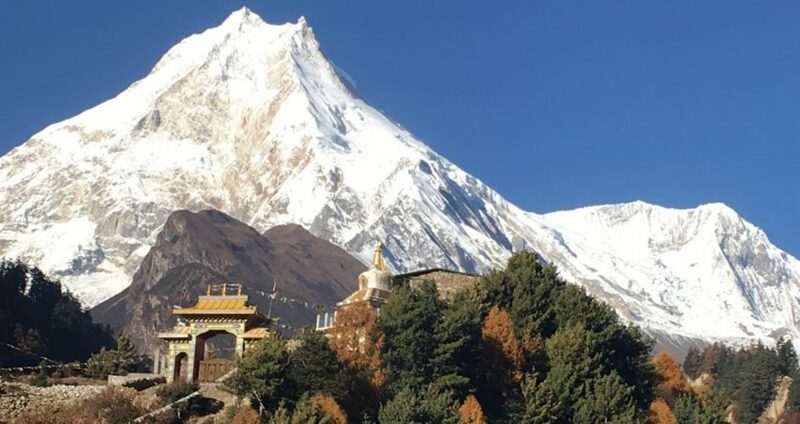 Popular day trips include a visit to Manaslu base camp from Samagaon and a hike to the border with Tibet which is a 5 hour return trip from Samdo. The principal danger is altitude, specifically going too high too quickly. Taking a day for acclimatisation at Samagaon, Samdo, or Larkya Phedi may be helpful. Follow these instructions for altitude sickness prevention. Another serious danger is being pushed off the trail by donkeys, which has resulted in the deaths of some trekkers. Be alert for the bells of approaching donkeys and make sure you are on the inside of the trail, out of the way of donkeys, and wait until they have passed before proceeding. There are also cases of trekkers being blown off of trails by wind. Cold and wind can be dangerous, so suitable clothing is essential. Snow and ice may be a problem at the Larkya La Pass, and some trail sections and stream crossings may be icy, especially in November or later. Trekking poles and light crampons (aka mini spikes) can be very helpful in reducing the risk of slipping, particularly on the steep descent after crossing the pass. Gaiters may be helpful in deep snow or blowing snow. Himalayan Rescue Association is an organization arranging / planning for emergency evacuations in the mountains.